James DiGeorgia, the founder and publisher of Highest Buyer and Finest Known , was wunderkind, a self-made millionaire before he turned 21, turning a hobby of coin collecting he began at the age of seven into a multi-million dollar business while still a teenager. Remarkably, James launched his first rare coin business, Gem Coins, in Connecticut in 1976 in Danbury's North Street shopping complex while he was still a junior in high school. "I rented offices by saying I was 18 and paying the rent a year ahead. Then I had to arrange my high school class schedule to end as early as possible so I could race down to my offices to meet customers who were either buying or selling precious metals, scrap bullion or rare coins. I ran classified ads in the local papers. You can't imagine the incredible volume of business a little ad in those small papers generated. My mother was an RN and my father a professional musician. They had no clue what I was doing and how much money I was making. It was crazy, at the age of seventeen I was making more in a month or two than many of my teachers were being paid in a year. I saw in the local paper what my high school principal was making, and I was astounded to discover I made more that year than he made in the previous five. I had to laugh. The only time I ever talked to him is when a nurse sent me to his office for kissing a girl in the hallway between classes." As the bull market in silver and gold from 1976 though 1980 gained momentum, James was able to generate over a million dollars in profits from less than $25,000 he obtained from his childhood collection. Graduating from the University of Western Connecticut in 1980, completing a BA in Economics in just 2 and a half years, he went to work over the following 10 years for some of the most prestigious rare coin and precious metals dealers in the world. "I couldn't linger in school. My parents' health was fading fast and I needed to help provide for their support. My mother absolutely insisted on my getting a 4 year degree. She was a strong willed woman. When she insisted, I decided I would do it, BUT I raced to get the four year degree by attending as many as four Universities at the same time and gathered credits to accelerate my graduation. Those years were literally a blur. By the time I graduated, the bull market in gold and precious metals was over. So, I decided to accept work at the best firms to gain enough knowledge, and guild my business acumen." From 1980 to 1991 James had bought and sold well over a hundred million dollars in rare coins, and traded much more in precious metals. "I loved the precious metals and rare coin business. It took me literally all over the world. I made friends in many of the top Swiss, Hong Kong and British Banks. I established business and banking connections in France, Belgium, Netherlands, Italy, Norway, China and Thailand, every step of the way deepening my understanding, not only about rare coins and precious metals, but the economics of the world's financial markets." James was instrumental in building a rare coin firm into a hundred million dollar yearly business. In 1992 he was approached by Weiss Research, Inc. to become the editor of the Silver & Gold Report, which at that time, was the single most prominent 100% unbiased and independent precious metals newsletter in the world. "I wrote the Silver & Gold Report and became a consumer advocate and precious metals stock analyst. I loved it. I exposed many multi-million dollar frauds and was featured in Barrons. I was quoted frequently in newspapers and magazines around the world including the New York Times, NY Post, Chicago Tribune, LA Times and Changing Times, just to name a few of the dozens and dozens of media. In 1997, I was convinced the precious metals market was going to be dead for years. My horizons were broadening and maturing at Weiss Research, Inc. I started reading and researching about interest rates, the bond markets and break- through technologies being developed by emerging companies. I was convinced, barring some exogenous event, the stock market, particularly the NASDAQ, was going to go berserk. I persuaded my publisher to allow me to launch 21st Century Investor, a newsletter dedicated to hunting down high-tech and emerging technology companies. My publisher was gracious and kind. He let me leave his firm and made it possible to take 21st Century Investor with me. I will always be grateful. I traveled the world again setting up offices in Hong Kong and Manila. I even took an interest in the highly respected Oil & Energy Report as one of its publishers. Back then the world opened up to me. I was hunting down investing opportunities in, literally, the four corners of the planet, and it paid off tremendously. I caught the Internet, communications and technology boom that lasted through the sudden crash of the NASDAQ in 2000/2001. The crash in technology and communication stocks hurt, but we did call the recession in 2001 and turned the lemons the market was handing out into sweet lemonade by recommending many shorts. While many newsletters died, 21st Century Investor prospered. Subscribers recognized I wasn't just a bull. I could generate profits both in a bear and bull market. In 2000, I launched 21st Century Alert. My vision was simple; develop a website that collected the sharpest news and financial analysts from around the world and present them in one place and at one low price. Many of these people charge big money, have large subscriber followings and can't be found anywhere else. Let's face it; the brightest analysts don't give away their best trading ideas and analysis on TV or the financial Internet portals for free. By aggregating, I've been able to give subscribers access to 20 great publications, websites, and advisory services for one low price. I have big plans for 21st Century Alert, more and more great financial analysts are joining with their publications and contributing to our 21st Century Morning Briefing. The service is already amazing but it's about to reach a new level." James DiGeorgia is the Author of several best-selling books including, The New Bull Market in Gold , The Rise of Gold in the 21st Century and The Global War for Oil . He currently edits and publishes: Gold and Energy Advisor , Superstock Investor , and also publishes the following investment advisories including: Gold and Energy Options Trader , Mohan's Market Force , and is the founder of Finest Known , a rare coin and precious metals dealership located in Boca Raton, Florida. James DiGeorgia is still often quoted in the media and was recently featured on FOX TV's Cavuto and Company. Among his other interests, he founded Renown Health Products a company dedicated to bringing legitimate anti-aging products and information to the public at the lowest possible price including Revatrol . "Bottom line: The longer my subscribers live, the better my business. There are some great ways to make sure you improve your life expectancy. I consider it an obligation to provide the most accurate information and the best products on the market at the lowest possible price." James holds a 4th degree Black Belt in Ju Jitsu and a 2nd degree Black Belt in Judo and has taught and trained in more than a dozen countries. "I grew up in New York; you needed to find some way to fend off the bullies and survive. But, I soon fell in love with sport judo and trained as many as 4 days a week, winning many of the tournaments I entered. Getting thrown around and grappling toughened me up enormously. Anyone wanting to become a better businessperson or investor would do well to study a martial art." James lives in Boca Raton, Florida with his wife, Lisa, and 9 year old twins, Danielle and Alexander, who attend Pine Crest Elementary School. 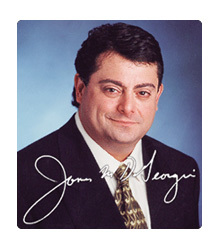 James DiGeorgia & Associates, Inc. employs over 30 people including many of his family members. "My brothers-in-law are more like brothers to me. They're literally are my right and left hands in my businesses. Without their support and commitment I'd be lost." James DiGeorgia is currently touring the United States holding seminars on Gold, Silver, Energy and Stock Market investing. Be sure to meet him if given the opportunity. "I base my whole professional and investing life on one precept: If you have the right information at the right time, making profitable investments can be very easy."